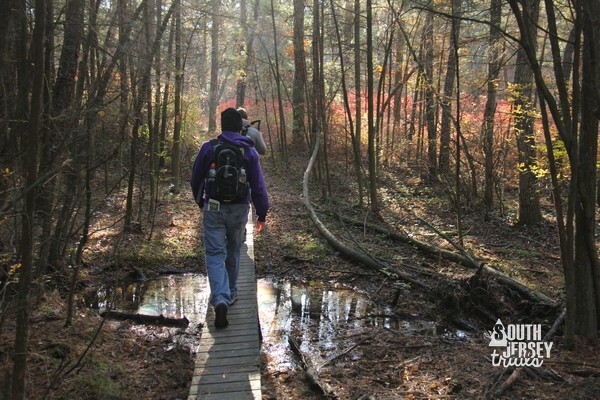 Terrain – Pine forests, cedar swamps, open areas, dirt roads, rivers, swamps, hills. 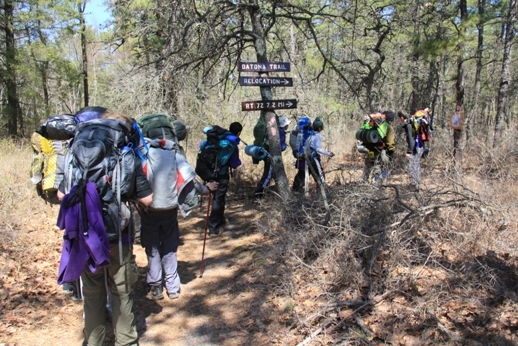 Trailheads – This day starts at Lower Forge Campground (39°43’33.23″N, 74°40’23.90″W) and ends at Brendan Byrne Campground ( 39°52’20.67″N, 74°31’18.44″W). Markings – Pink, usually on trees. 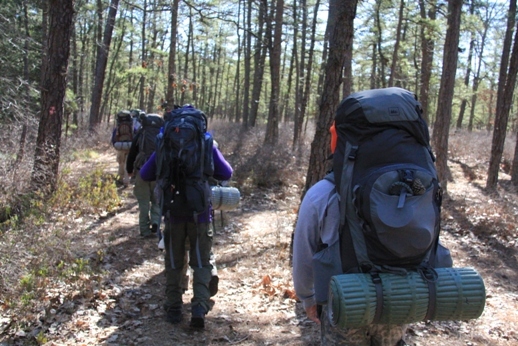 Sometimes disappear or hard to follow, but much improved the last few years, thanks to the hard work of the Outdoors Club of South Jersey. Map – Map of the Batona Trail – note that this does not include the reroutes. 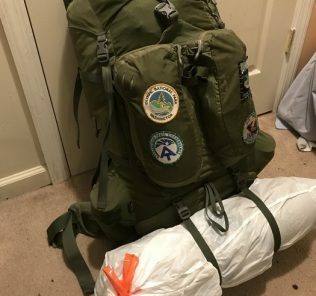 The Plan: I’ve been fortunate enough to backpack the whole Batona Trail three times (2011, 2013, and 2016), as well as to have done a few one night trips on it previous to those years. 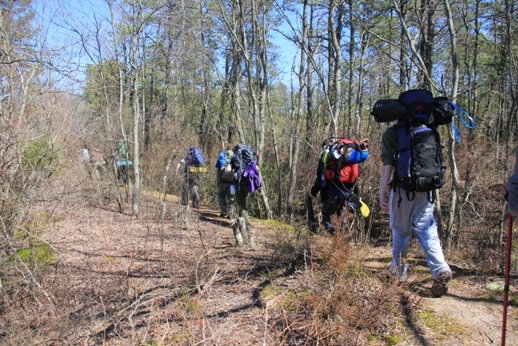 Each time was as an adult with a group of Scouts (five of whom finished in 2011, 13 of whom finished in 2013, and 2 who did the whole thing in 2 days in 2016). I’ll present here our 2013 hike plan, which covered the two new reroutes. If you plan to do the whole thing, you might be faster (2 or 3 days for some folks) or slower (you can space it out over 5 days if you wanted to), but this plan is for four days. Very sad note: As of Labor Day 2016, the Apple Pie Hill Fire Tower is fenced off and only accessible when manned during the day during times of high fire risk. You still can access the tower, it is NOT completely closed off. 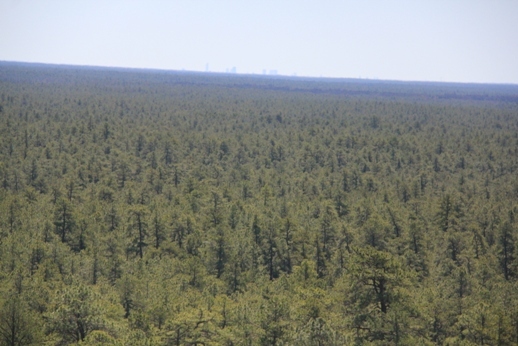 To not be disappointed, visitors to the fire tower can call NJ Forest Fire Service Division B Headquarters to find out of the tower is manned. The number is (609) 726-9010. 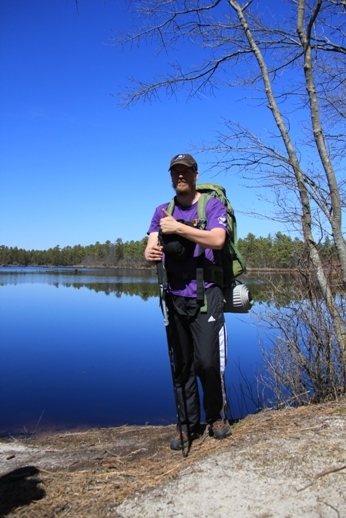 By your third day, you should be getting your backpacking legs and should be ready to go in the morning. 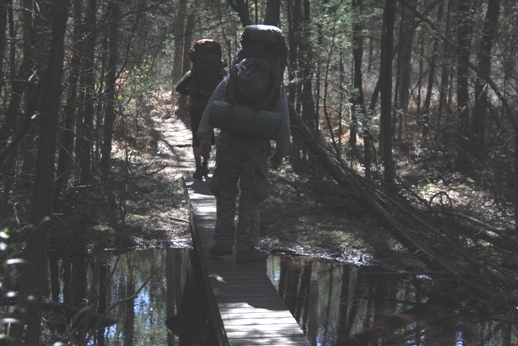 You’ll start with a 5.8 mile walk through some lovely pine forest with some sporadic road crossings and a few small swamps. This is not the most interesting section of the trail, but it’s flat and will get you warmed up on this long day. …and pop out on Carranza Road (it will be your first paved road for the day). Here, we generally drop our packs for the short walk (left) down to the Carranza Memorial (or you can cheat and carry them with you). The was dedicated to Emilio Carranza, a Mexican air force pilot who duplicated Charles Lindburgh’s goodwill flight distance with one of his own, from Mexico City to New York City. Our his return flight, he flew through a thunderstorm and was tossed from his plane to his death. 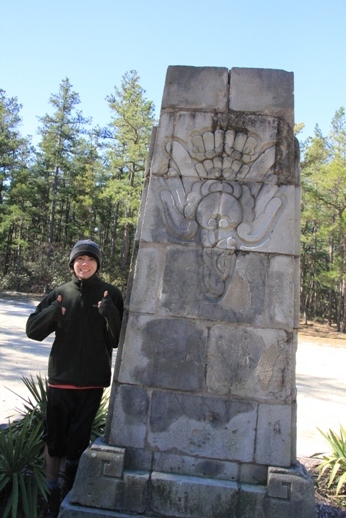 This monument, built with change from Mexican children, marks the place near where his body was found. 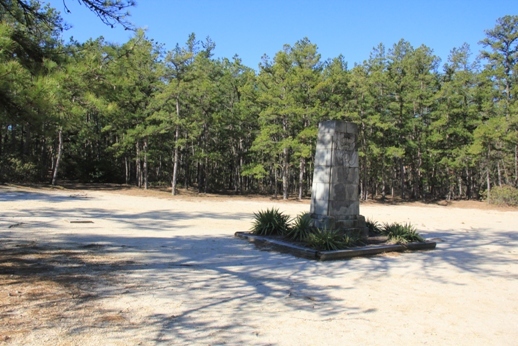 After checking out the memorial, you can backtrack to the trail or (if you are a dirty, rotten cheater), walk down the road across Carranza Road, which will take you to Batona Camp and rejoin the trail. Either way, you’ll hit Batona Camp within five minutes. Lovely water pump to the right of this view. 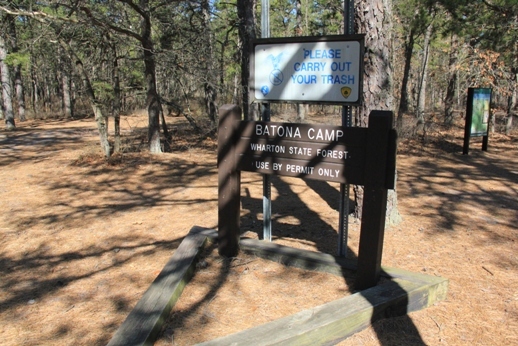 – Batona Camp, Wharton State Forest – 6 trail miles from Lower Forge (Trail Mile 31 on paper, about 32 with the reroute). 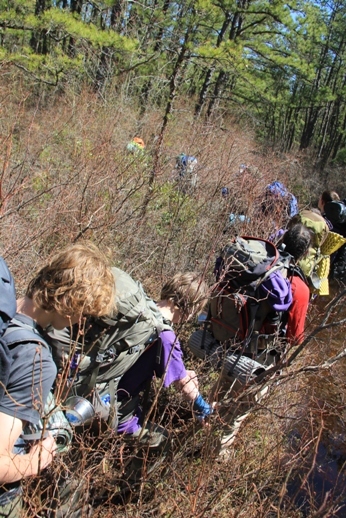 – This camp is popular, as it’s accessible by Carranza Road. It has pit toilets and a real water pump. 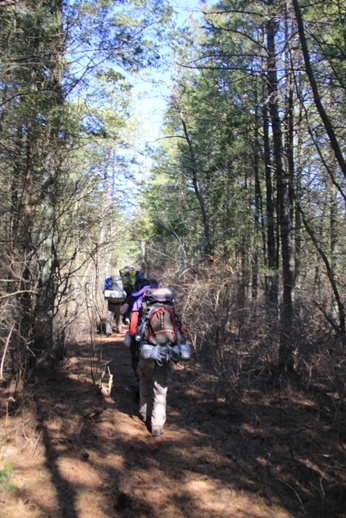 It also has the distinction of being the only campground without a walk in, as the trail goes right through the camp. This is a great alternative if you want to shorten day three OR if you want to try to do the trail in three days. 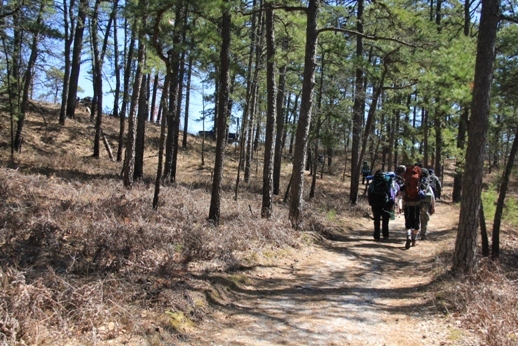 Back to the trail. The next section used to be my favorite, a 3.6 mile or so stretch from Carranza Memorial to Apple Pie Hill and would make a great day hike. 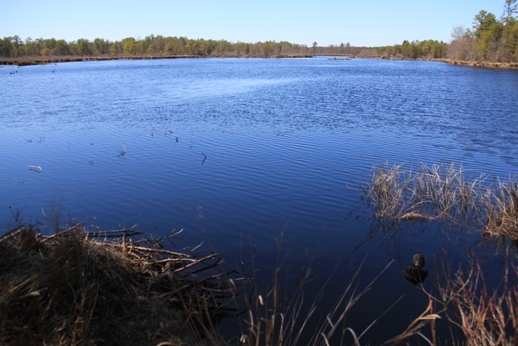 You’ll parallel the road a bit, catch a great view of the swamp, and meander between the swamp and the road for a while. 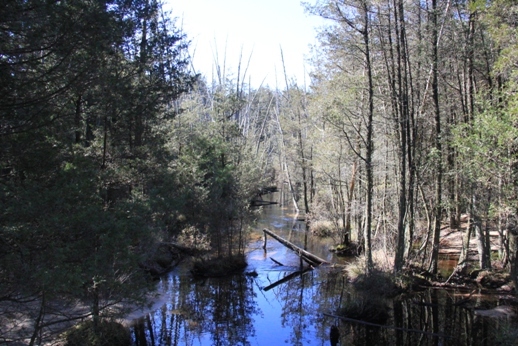 Swamp view shortly after Batona Campground. You’ll pop out onto the road and cross Skit Branch on a bridge. AFTER THE BRIDGE MAKE A SHARP RIGHT IMMEDIATELY. I’ve missed this turn before, and its better marked now, but don’t miss it! After you duck back into the woods, you’ll stay there for a bit. 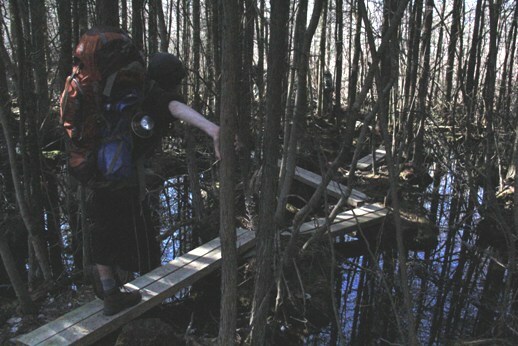 You’ll head through some swamps on bridges, head up Mt. Korbar, head right back down Mt. 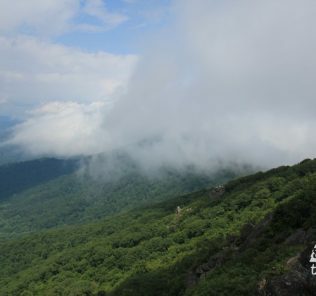 Korbar (named in honor of Walter Korszniak and Morris Bardock who worked on the Batona Trail at the beginning source) or perhaps Tea Time Hill (why does this hill have two names? 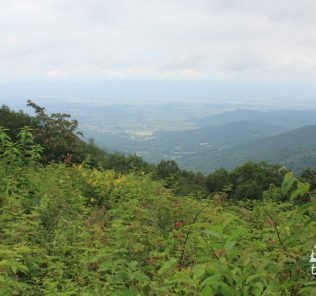 ), cross a few dirt roads, and then climb Apple Pie Hill. 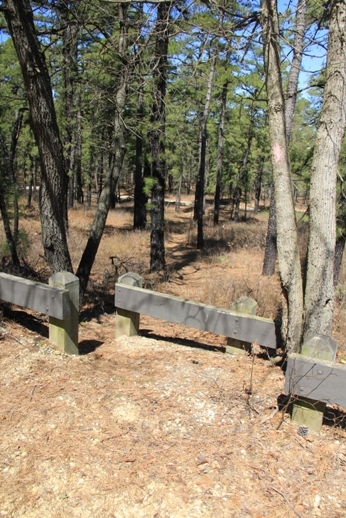 There is a break in the fence that the trail passes through. Sadly, the teapot on top of this was missing as of 2016. 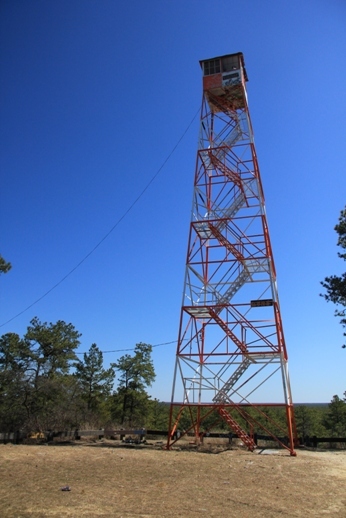 Apple Pie Hill Fire Tower. This is pretty much exactly 10 miles into your day, and is a great spot to stop and have lunch. 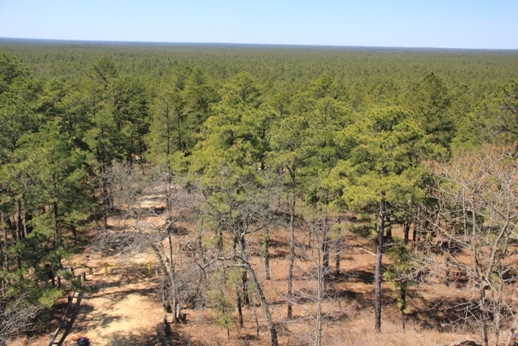 Enjoy the views from the ground, or climb the fire tower for a chance to see both Philadelphia and Atlantic City on a clear day, as well as a few hundred square miles of woods. Sadly, due to inconsiderate idiots, the tower is now fenced in and only opened when manned. If it’s open, don’t miss the chance to climb up. Note: You read right, you CAN still can access the tower, it is NOT completely closed off. 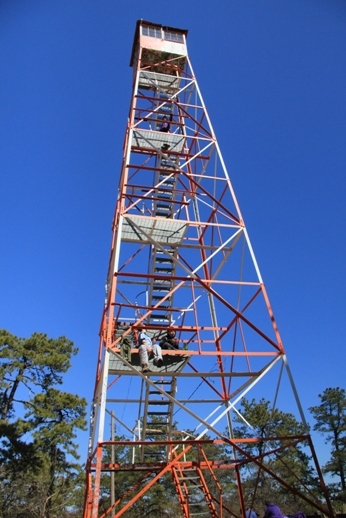 However, you can only go up when the tower is actively being manned, which is during times of drought during the day. A nice view of the woods. When you’re done admiring the view, head out the gap in the fence (the OTHER gap, by where the road at the top of the hill is blocked off). 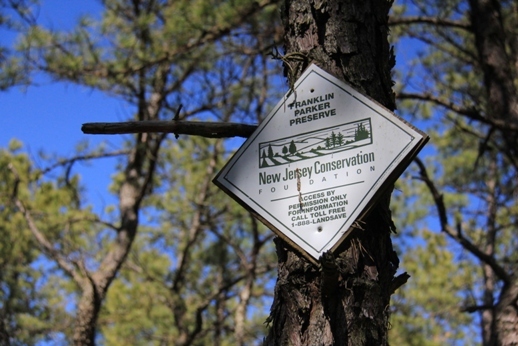 You’ll head into the Parker Preserve and walk a mile to Route 532. Way out of the fence. Now entering the Parker Preserve. Walking through the Parker Preserve. 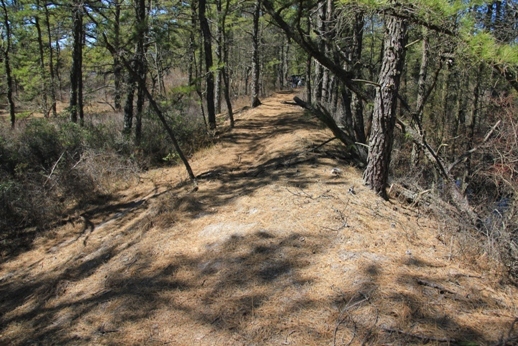 Cross Route 532 and you’re going to hit my new favorite part of the trail, the Parker Preserve reroute. This used to be a 4.5 mile roadwalk past blueberry farms that was painful on the knees (by which I mean, absolute torture). It’s now a 7.2 adventure through the woods and swamps. The extra 2.7 miles are well worth the walking. Here is a lovely map of the Parker Preserve reroute. The first stretch is largely along old sand roads. 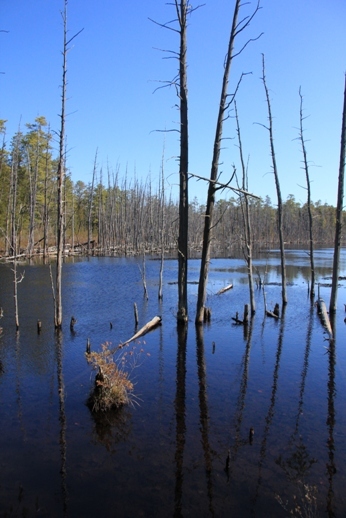 Some of these are flooded, which makes for fun bushwacking around the flooded areas (2016 note – there are now trails cut around most of the puddles, which makes for much less bushwacking. 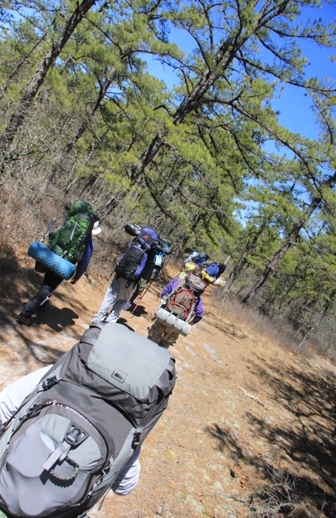 Thanks Outdoors Club of South Jersey!). 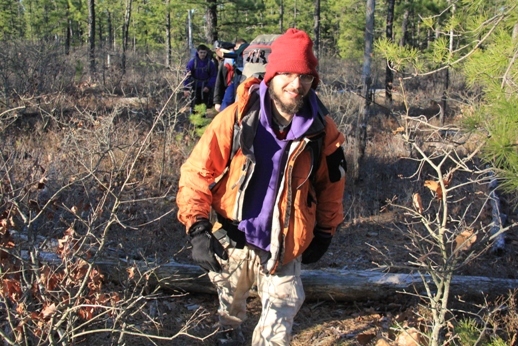 So you have to do this (but not really, unless you’ve taken your time machine to the trail). 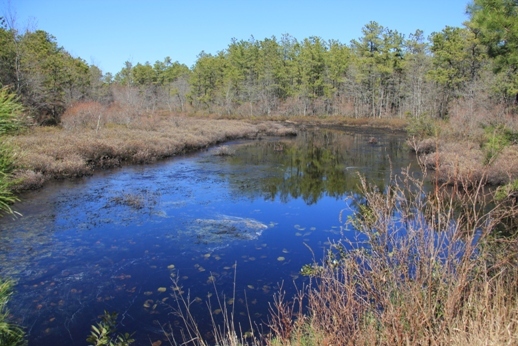 The trail will then alternate between roads and beautiful walks next to Cranberry bogs. And haven’t learned a new pose three years later). Along the edge of a bog. 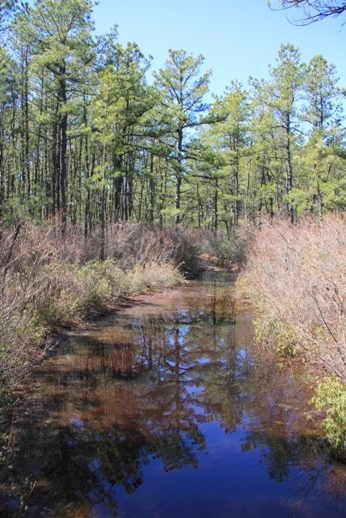 Another view of the bog. 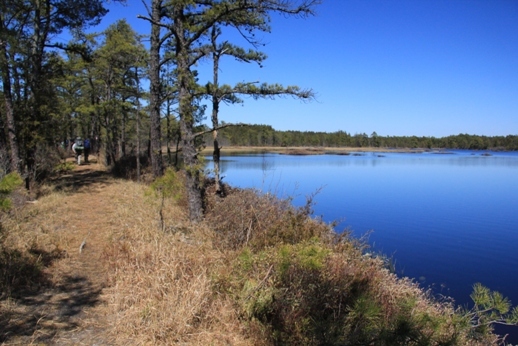 The trail dives off on onto the old cranberry dikes. 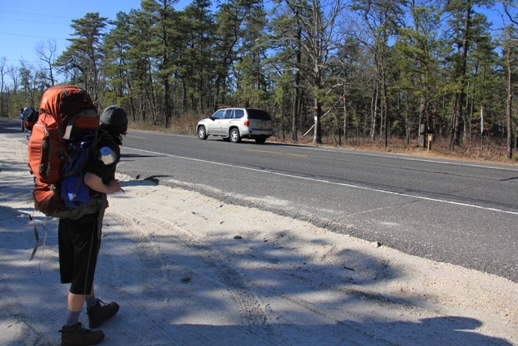 Eventually, you’ll come out onto Route 563, roughly halfway through the preserve. Crossing a nice little bridge at 563. The first half of the reroute is nice, but the second half is really awesome. 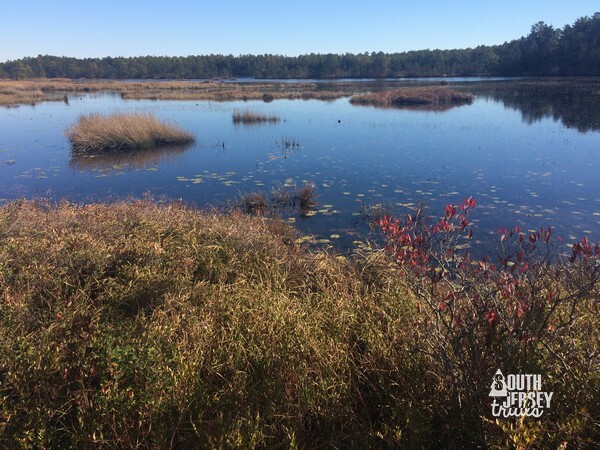 There are even more swamp walks, more bog views, and some creative bits of trail work, like a long bridge and a swamp hop very close to where you emerge on Route 72. 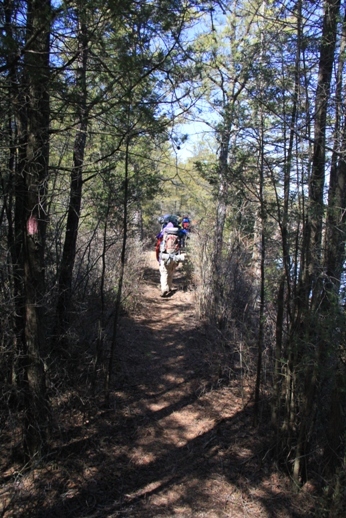 Coming in from 563 is a tunnel of trees and shrubs that the trail was hacked out of. Probably my favorite part of the Batona at the moment, as these short bridges connect little islands in the swamp. I highly suggest checking this part out, I can’t imagine it will hold up to years of use… 2016 – but years in it still looks good! 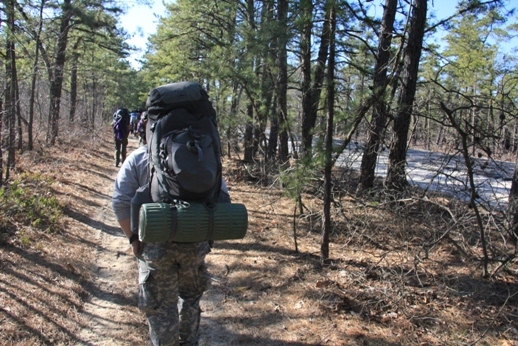 Once you emerge out of the woods onto Route 72, you’ll turn left and walk down that highway before crossing over the road and entering into Brendan Byrne State Forest, your last set of state land for this hike. Yay! 2016 – now marked with large signs on either side of Route 72. Getting ready to cross the highway. Once you cross the road, it’s 1.4 miles to the paved road by Pakim Pond. Along the walk, you’ll cross a number of dirt roads, including one that says “Campground” with an arrow. 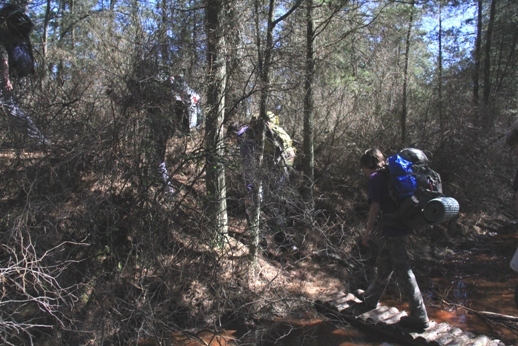 Ignore this and keep walking on the trail unless you want to backtrack the next day! 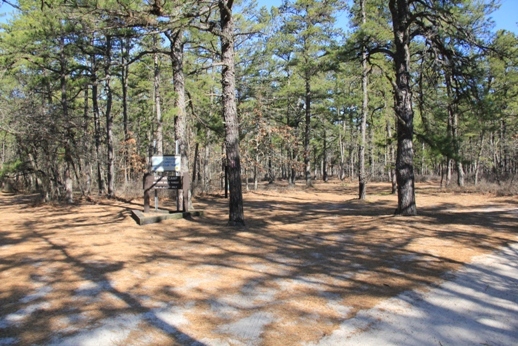 When you hit the pavement, you can either turn right and walk 3/4 of a mile or so to the campground or, if it’s early, turn left and walk to the Pakim Pond Picnic area. Our most recent hike, we covered our 19 miles early, so we cooked and ate dinner at the picnic area. If it’s late, or you’re tired (hey, it’s been a long day), go right to the campsite, you’ll see the pond tomorrow along the trail. 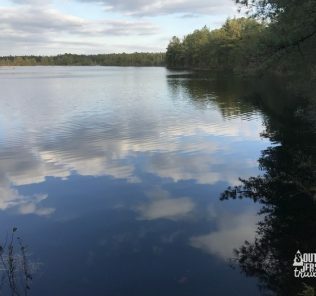 – Brendan Byrne Campground, Brendan Byrne State Forest – 13.5 or 14 miles from Batona Camp with the second new reroute or 19.5 miles or so from Lower Forge with the walk ins (Mile 45 or so on paper). 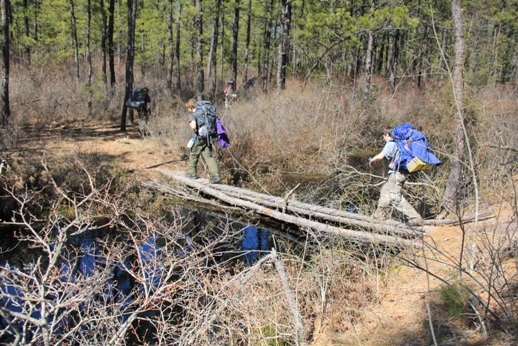 The camp is at least 3/4 of a mile down the road from where the trail comes out at Pakim Pond. Nicest of the campgrounds, it features real bathrooms with sinks and flush toilets and water spigots (not even a pump, a spigot!)! 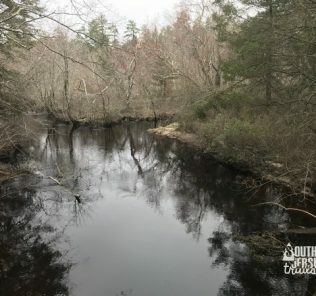 Group sites are $3 per person, per night (plus $10 fee), regular sites are $20 per night for New Jersey residents (plus $10 fee). 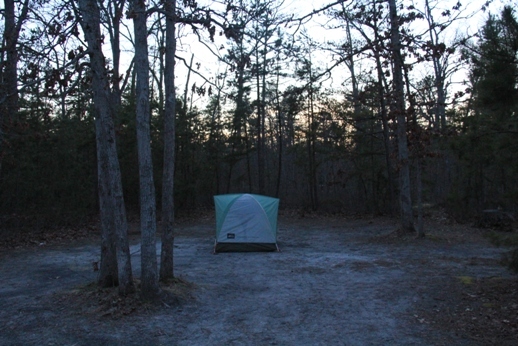 Backpacking tent at the Brendan Byrne Group Site. The other 14 of us didn’t bother to set up our tents and just slept outside on the ground. It would have been hilarious if someone had walked up to our site. This was awesome in early April, not recommended for the summer where the bugs are out in force. 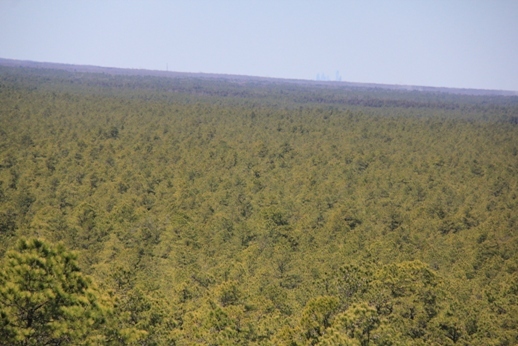 Forests, cedar swamps, Carranza Memorial, Apple Pie Hill (with views of Philly and Atlantic City), Parker Preserve. 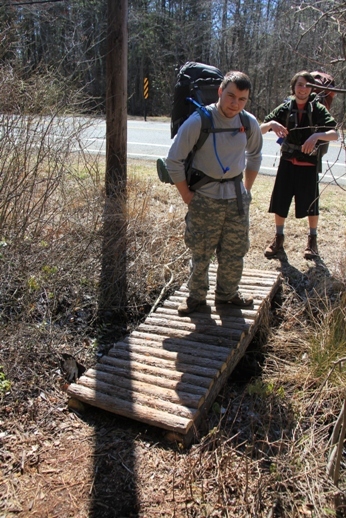 This is a long stretch, almost 20 miles if coming from Lower Forge. This has my old favorite section of the Batona and my new favorite section of the Batona. It's the best and the best. Super long day, but totally worth it.